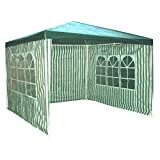 This page showcases one of the widest and best range of garden gazebos on the internet. 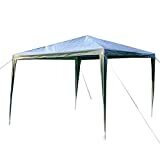 These gazebos tend to be most suitable for using in the garden during the summer months. Some gazebos also give some rain protection. Click on any of the products to visit the retailers store and find out further information. 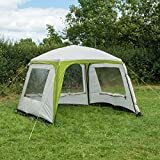 This page features what we term ‘standard gazebos.’ These are garden gazebos normally with a tubular steel frame with a material covering forming a roof. 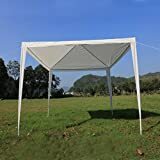 This type of gazebo is great for creating a bit of shade on those hot days and is great as a dining shelter for BBQs and picnics. The gazebos on this page are all erected by connecting together a series of tubular steel poles which form the rigid frame of the gazebo. The roof is then spread over the frame and the complete structure pegged down for stability. 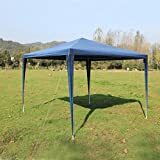 These type of gazebos normally take around 20 minutes to erect and require at least 2 people (4 is better). 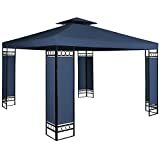 Most standard garden gazebos are designed to provide shade in hot weather and most are not designed to give protection from the rain. 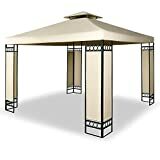 While most garden gazebos will give some element of protection from a rain shower. 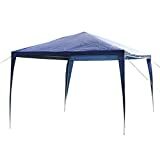 If you’re looking for protection from heavier rain, make sure you go for a gazebo specifically designed to be waterproof. 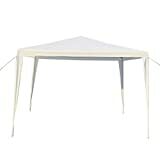 Gazebos come in all shapes and sizes. The smallest we have on this site are 2.4×2.4m in size, which would accommodate 2-3 people comfortably. 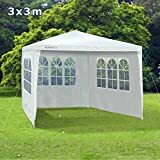 Generally 3x3m is the standard size of many square garden gazebos. This size would comfortably accommodate around 4 people. 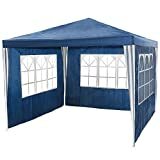 The gazebos featured on this page are generally designed to be used in a garden and so are not designed to be carried or transported large distances. As a result they tend to be fairly bulky and quite heavy. 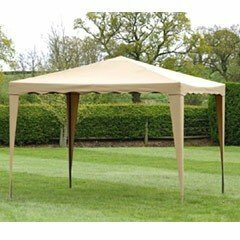 The more luxurious gazebos feature side panels as well as a roof which provide some protection against cold winds and rain.